Apenheul is unique. There is no other zoo in the world where you can see so many different species of primate roaming freely among the visitors. This gives you the chance to admire the animals up close. Fancy a day strolling around among the free-roaming primates? Then we ask you to stick to a few park rules. These rules mean you’ll be able to appreciate the primates at their best and that we’ll be able to keep the animals healthy and happy. The primates at Apenheul are naturally friendly and harmless. Let them do their own thing; they won’t harm you in any way and you’ll get to see them at their best and funniest! Do not pet the monkeys or pick them up. Picking a monkey up will give it quite a fright and it might think that you want to harm it. The primates get a special primate food from the animal handlers. People food, peanuts, sweets and fruit are not included in their diet. This food can make the primates very sick, so never feed the monkeys! Store your medicines, cigarettes and other drugs very carefully as they are very dangerous for the animals. We can lend you a special ‘100% monkey-proof’ bag so you can take all your stuff safely into the park without risking a monkey intrusion. Feel free to snack and eat sweets yourself, but do not do so in the areas where the primates are roaming freely. The map (which you will get at the entrance) shows exactly where you can and cannot eat. The use of selfie sticks is not permitted at Apenheul. A selfie stick might be seen as a threat by the primates. Of course there are also primates that do not roam freely in the park, such as the gorillas and orangutans. They do not live in cages or behind bars but on large, natural islands instead. This means you can see them up close and in a natural environment. Quite the experience! * Want to know which primates live at Apenheul? Check out our primates ABC! 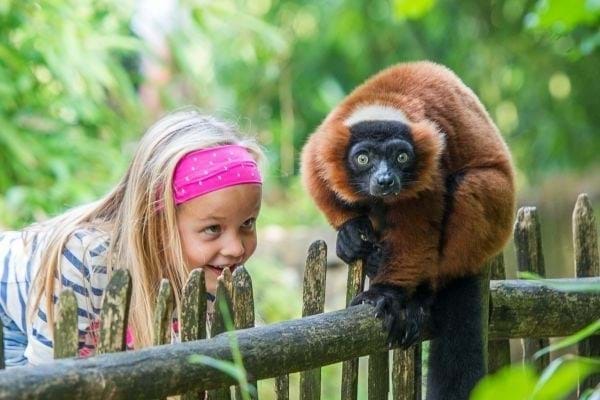 The zookeepers will tell you everything about the animals at Apenheul during the special presentations. All presentations are given in Dutch.